Color matching to the surrounding skin is extremely important in patients wearing maxillofacial prostheses. It is of utmost importance to know the different techniques of color matching and coloring in maxillofacial prostheses. The purpose of this study is to review the literature data with regard to color matching in maxillofacial prosthetics. 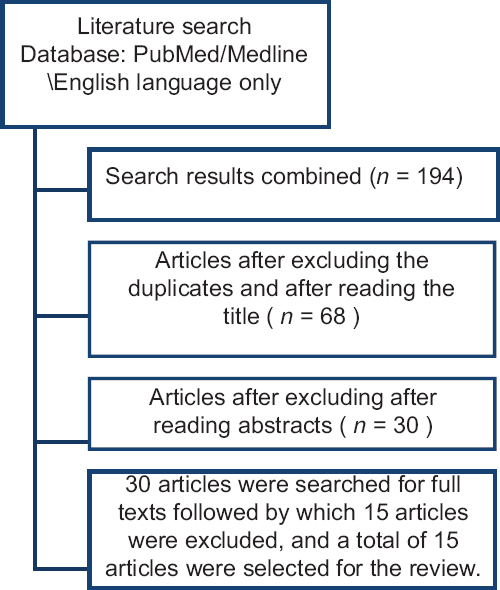 An electronic search of peer review restricted to English language dental literature was conducted to identify the relevant scientific article on color matching and coloring in maxillofacial prostheses. The publication year was up to December 2015 so that the search could include all the articles provided in that particular database. Two independent observers independently read the abstracts and later preselected full-text articles. A full-text review was carried out only for 15 articles. Out of the 15 articles, 7 were related to coloring using tinting, spraying, milling, and use of commercial cosmetics. Three studies were related to shade matching in maxillofacial prostheses. Two studies conducted the measurement of color in maxillofacial prostheses. Only one study had explained color and its relevance in maxillofacial prosthetics. Only one study was done for reproducing silicone shade guide matching Indian skin color. In addition, a single pilot study was done to measure facial skin and lip color in a human population sample stratified by race, gender, and age. Currently, there is no evidence discussing the best technique available for perfectly matching the color for the fabrication of maxillofacial prostheses. However, the latest instruments such as spectrophotometer and colorimeters are believed to have improved efficiency in matching the color. Purpose: The purpose of this in vitro research project was to evaluate and compare the wear behavior of human tooth enamel opposing monolithic zirconia and other different ceramic restorative materials and also to observe the tetragonal to monoclinic phase transformation in zirconia-based ceramics that may occur while simulating wear occurring at room temperature in a wet environment. Materials and Methods: A total of sixty samples were prepared for this study. Fifteen discs of glazed zirconia, 15 discs of polished zirconia without glaze, 15 discs of metal ceramic, and 15 discs of lithium disilicate were fabricated. Sixty extracted premolars were collected and randomly divided into four groups of 15 each. The discs and extracted human premolars were placed onto holders on a two-body wear machine under a constant load of 5 kg to simulate the oral wear cycle. A diffractometer was used to analyze phase transformation. One-way analysis of variance and Tukey's post hoc tests was used. 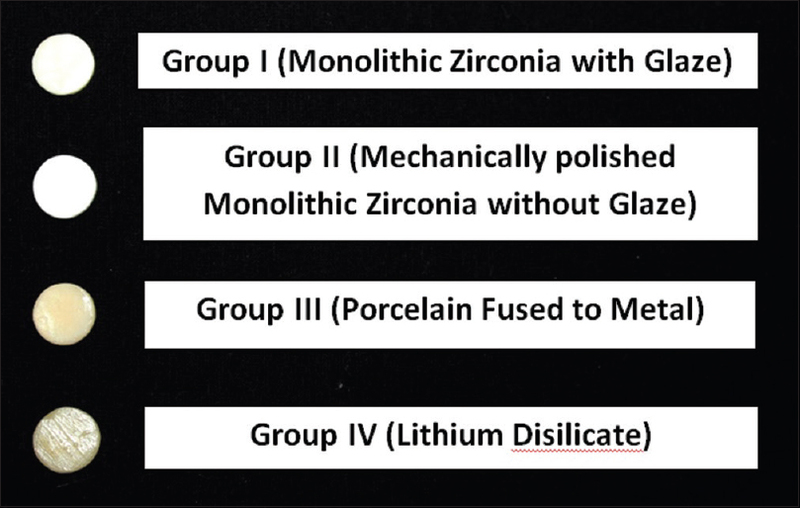 Results: The mean loss of height of tooth samples and its standard deviation for Group I (monolithic zirconia with glaze), Group II (mechanically polished monolithic zirconia without glaze), Group III (porcelain fused to metal), and Group IV (glazed monolithic lithium disilicate) was obtained as 0.2716 ± 0.1409, 0.1240 ± 0.0625, 0.1567 ± 0.0996, and 0.2377 ± 0.1350, respectively. The highest mean loss in height was observed in Group I and the least was observed in Group II. Conclusion: Mechanically polished zirconia showed the least amount of enamel wear followed by porcelain fused to metal and glazed monolithic lithium disilicate, whereas glazed monolithic zirconia showed the highest enamel wear. Purpose: Presence of functional tooth units is essential for preserving masticatory function among individuals. Representing the essence of health promotion practice, demand to measure varied evaluation outcomes is highlighted. Aim and Objectives:(1) To assess the influence of occlusal support and perceived chewing ability on oral health-related quality of life (OHRQoL) among adults attending a private dental institution in Mangalore. (2) To evaluate occlusal support using Eichner index (EI), perceived chewing ability using a self-administered questionnaire and OHRQoL using Oral Health Impact Profile-14 (OHIP-14). Materials and Methods: Overall, 300 adults attending a private dental institution in Mangalore were included. EI was used to group participants into three groups. The chewing ability was assessed using a questionnaire on perceived difficulty while chewing eight common foods. OHRQoL was measured employing OHIP-14. Perceived general and oral health status and demographic information were collected. Results: The mean perceived chewing ability score was 12.98 ± 6.2 and the mean total OHIP score was 9.23 ± 8.9. EI showed a significant relation with perceived chewing ability, OHIP, and perceived general health status (P < 0.05). Perceived chewing ability and OHIP demonstrated a significant correlation (r = 0.31, P< 0.001). Age, gender, education, occupation, monthly income, family income, and number of family members demonstrated a significant association with EI (P < 0.05). Binary logistic regression analysis revealed that EI, perceived chewing ability, and perceived oral health emerged as significant predictors of OHRQoL (P < 0.05). Conclusions: Occlusal support was significantly associated with perceived chewing ability, OHRQoL, and perceived general health status. Aim: The aim of the present study was to assess the change in physical properties (surface roughness, surface hardness and phase transformation) after surface grinding of zirconia by using three commercially available abrasives. 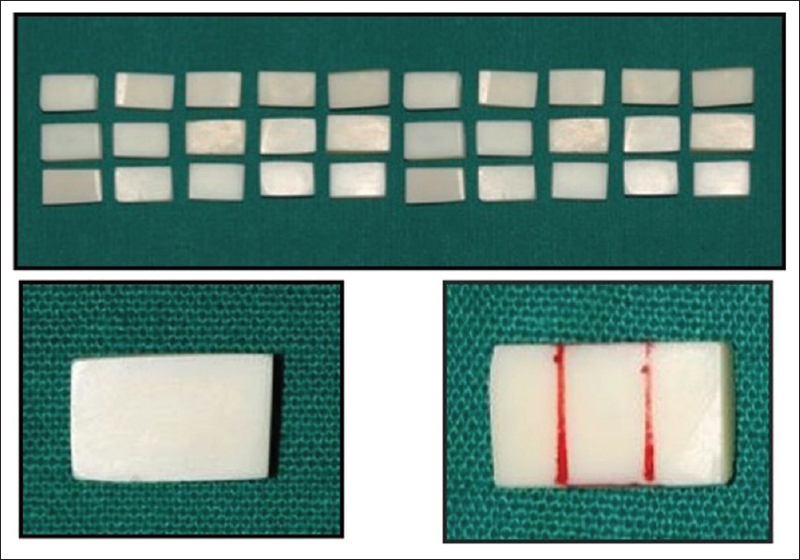 Materials and Methods: Thirty sintered zirconia specimens were prepared and divided into three groups namely Group M (grinded using Mani Dia diamond bur standard grit), Group T (grinded using Tri Hawk diamond bur coarse grit) and Group P (grinded using Predator carbide bur). A customised assembly was used to follow a standardised protocol for surface grinding. The surface roughness, surface hardness and phase transformation was recorded before and after the grinding procedure. Statistical Analysis Used: ANOVA and Bonferroni post hoc test were used to assess the values obtained after the testing the surface roughness and surface hardness. Results: The results of the present study revealed the average values of change in surface roughness as Group M (0.44 μm) and Group T (1.235 μm) and Group P (-0.88 μm). The average values of change in surface hardness were Group T (19.578 HV), Group M (46.722 HV) and Group P (36.429 HV). The change in surface hardness was not statistically significant. There was no phase transformation seen after the grinding procedure. Clinical Significance: Carbide burs along with copious water irrigation when used to grind zirconia intra-orally produces has a polishing effect, minimal change in hardness & no phase transformation. The present study advocates the use of carbides for chair-side grinding of zirconia. Objective: Time and again, it has been shown that active learning promotes critical thinking, and this environment has to be fostered in dental education too. Therefore, the present study was carried out with an aim to know the effectiveness of case-based learning (CBL) in enhancing the knowledge of dental interns of a dental institute in India. Materials and Methods: This pre-post single-blinded, experimental study was conducted in two sessions on a purposive sample of 45 dental interns who gave informed consent. The interns answered a pretest questionnaire comprising questions related to their knowledge of hyperplastic tissue in complete denture patients. The interns were randomly allocated into three subgroups for thorough discussion. Each group viewed all three parts of a case related to hyperplastic tissue and presented the case in the presence of a facilitator. The facilitator discussed the subject with the three subgroups. A post-test was conducted immediately, and the results were compared with the pretest. The facilitator explained about hyperplastic tissue with an audio-visual aid after the post-test was administered. The perception of interns toward CBL was assessed by a standard questionnaire. Results: On analysis, the comparison of the overall knowledge scores pre- and post-CBL showed a statistically significant increase from 9.8 ± 2.14 to 12.6 ± 1.37 (P < 0.001). Conclusion: CBL proved to be effective in enhancing the knowledge of dental interns. Purpose: The aim of this study was to investigate the cytotoxicity in human gingival fibroblast by 3-(4,5-dimethylthiazol-2-yl)-2,5-diphenyltetrazolium bromide (MTT) assay and corrosion behavior by potentiodynamic polarization technique of commercially pure titanium (Ti 12) and its alloy Ti-6Al-4V (Ti 31). Materials and Methods: In the present in vitro study, cytotoxicity of Ti 12 and Ti 31 in human gingival fibroblast by MTT assay and the corrosion behavior by potentiodynamic polarization technique in aqueous solutions of 0.1 N NaCl, 0.1 N KCl, and artificial saliva with and without NaF were studied. Results: The independent t-test within materials and paired t-test with time interval showed higher cell viability for Ti 12 compared to Ti 31. Over a period, cell viability found to stabilize in both Ti 12 and Ti 31. The effects of ions of Ti and alloying elements aluminum and vanadium on the cell viability were found with incubation period of cells on samples to 72 h. The electrochemical behavior of Ti 12 and Ti 31 in different experimental solutions showed a general tendency for the immersion potential to shift steadily toward nobler values indicated formation of TiO2and additional metal oxides. The multiphase alloy Ti-6Al-4V showed more surface pitting. Conclusion: The commercially pure Ti showed better cell viability compared to Ti 31. Less cell viability in Ti 31 is because of the presence of aluminum and vanadium. 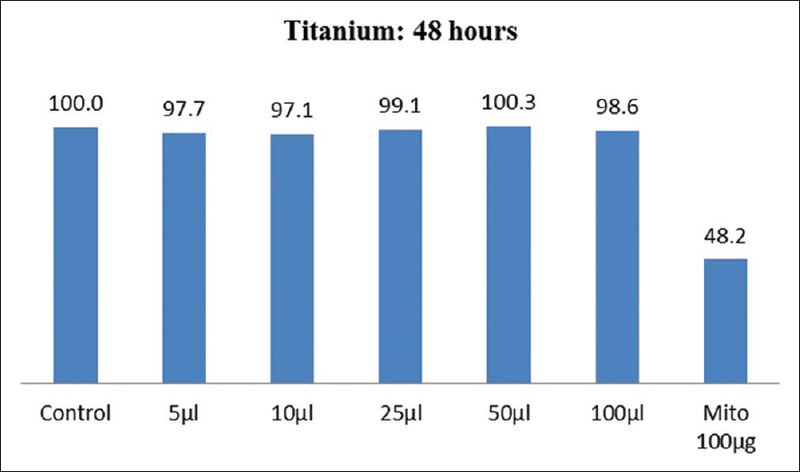 A significant decrease in cytotoxicity due to the formation of TiO2over a period of time was observed both in Ti 12 and Ti 31. The electrochemical behavior of Ti 12 and Ti 31 in different experimental solutions showed a general tendency for the immersion potential to shift steadily toward nobler values indicated formation of TiO2 and additional metal oxides. Ti 31 alloy showed surface pitting because of its multiphase structure. Introduction: A dental impression is a negative imprint of an oral structure that can be used to produce a positive cast of a patient's teeth as a permanent record. The accuracy of the impression affects the accuracy of the cast, and a precise impression is needed in order to create prosthesis with optimal fitting. Minimization of misfit is an important aim in prosthesis science and dental implants. 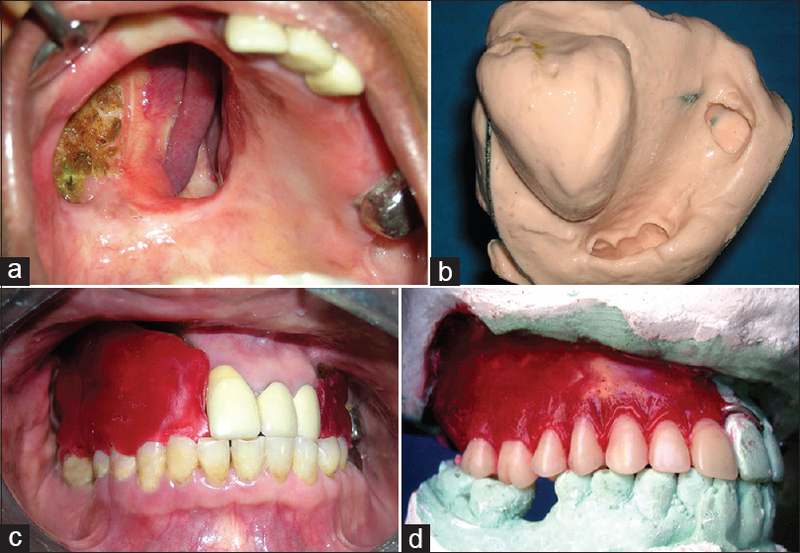 The aim of this study was to evaluate the effects of the materials and techniques used to take an impression on the vertical misfit of implant-supported, screw-retained, three-unit bridges. 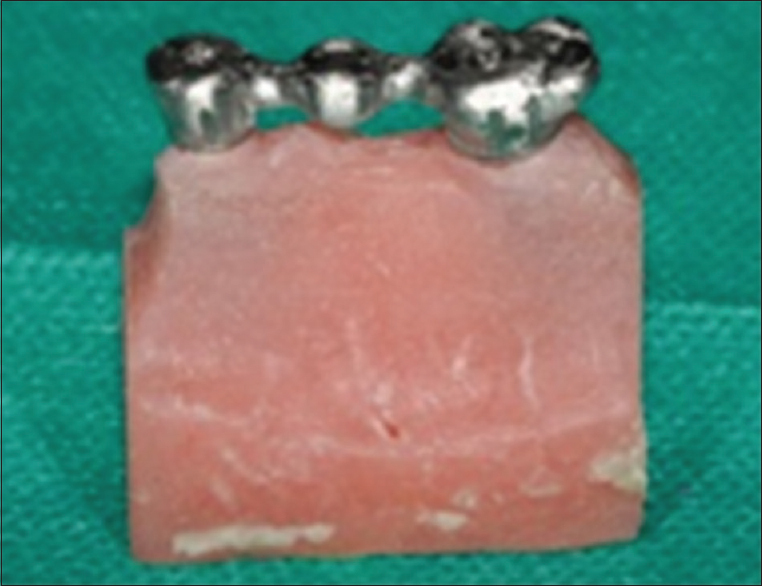 Materials and Methods: The principal model used was an acrylic block with two ITI implants. A 1.5-mm abutment was attached to fixtures with torque of 25 N.cm. A base-metal framework was built on the abutment in the acrylic block. The abutments of the acrylic model were unscrewed and fixture-level impressions were made. The impression techniques included open/closed-tray techniques and the impression materials were polyether and polyvinyl siloxane. Forty acrylic custom trays were built for each impression. The marginal gap in the framework at three points (buccal, lingual, and distal) was measured using an optical microscope with ×250. Results: It is demonstrated that in all 360 evaluated samples, the mean vertical misfit in polyether samples of molar and premolar teeth was significantly lower than in polyvinyl siloxane (P < 0.001 and P = 0.017, respectively) in all three locations of the molar and lingual premolar examined (buccal, lingual, and distal), the mean vertical misfit of the polyether samples was significantly lower than those of polyvinyl siloxane (P < 0.01). 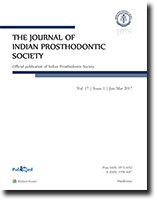 On the other hand, although the mean vertical misfit using the open-tray technique in the molar teeth was significantly lower than with the closed-tray method (P = 0.002), no statistical difference was seen between the open-tray and closed-tray technique in general (P = 0.87). Conclusion: Within the limitations of this study, the following conclusions can be drawn: The impression method had no effect on marginal discrepancy of 3-unit screw retained fixed partial dentures. A higher marginal accuracy was obtained using polyether impression material compared to polyvinyl siloxane. Aim and Objectives: The aim of the study was to evaluate the prevalence of temporomandibular disorder (TMD) by the use of Helkimo's index (anamnestic [Ai] and clinical dysfunction [Di] component) in the nonpatient population (dental students) of Faridabad college. Settings and Design: A questionnaire-based survey was carried out among students of dental college for signs and symptoms of TMD and also clinical examination was done. The results were scored and according to scoring severity of TMD were assessed in the specified population. Materials and Methods: About 580 students were assessed for TMD by the use of Helkimo's index (Ai and Di component). Descriptive statistical analysis was done. Results: Among the study group, 15% were found to have TMDs. 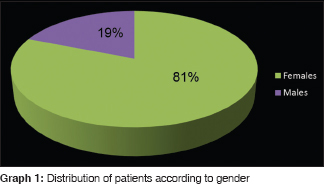 Out of the affected students, 79% females and 21% males were having symptoms. Out of the signs and symptoms present, 7% students were found to have sound in temporomandibular joint followed by pain in 3% and fatigue in 2% of students. On clinical examination, limited mouth opening was found in 6% students followed by locked mandible in 1%, deviation of jaw in 0.6%, and jaw rigidity of mandible in 0.6% of individual. Conclusion: To summarize, Helkimo index is a well-founded index to assess TMD in a specified population. Signs and symptoms of TMD were present among students although low prevalence of TMD was found in the students. Introduction: Badly broken or structurally compromised posterior teeth are frequently associated with crown/root fracture. Numerous restorative materials have been used to fabricate indirect full-coverage restorations for such teeth. This study aims to evaluate and compare the effect of restorative materials on the stress distribution pattern in a mandibular first molar tooth, under varying loading conditions and to compare the stress distribution pattern in five commonly used indirect restorative materials. Materials and Methods: Five three-dimensional finite element models representing a mandibular first molar tooth restored with crowns of gold, porcelain fused to metal, composite (Artglass), alumina-based zirconia (In-Ceram Zirconia [ICZ]), and double-layered zirconia-based materials (zirconia core veneered with porcelain, Lava) were constructed, using a Finite Element Analysis Software (ANSYS version 10; ANSYS Inc., Canonsburg, PA, USA). Two loading conditions were applied, simulating maximum bite force of 600 N axially and normal masticatory bite force of 225 N axially and nonaxially. Results: Both all-ceramic crowns allowed the least amount of stress distribution to the surrounding tooth structure. In maximum bite force-simulation test, alumina-based all-ceramic crown displayed the highest von Mises stresses (123.745 MPa). In the masticatory bite force-simulation test, both all-ceramic crowns (122.503–133.13 MPa) displayed the highest von Mises stresses. Conclusions: ICZ crown displayed the highest peak von Mises stress values under maximum and masticatory bite forces. 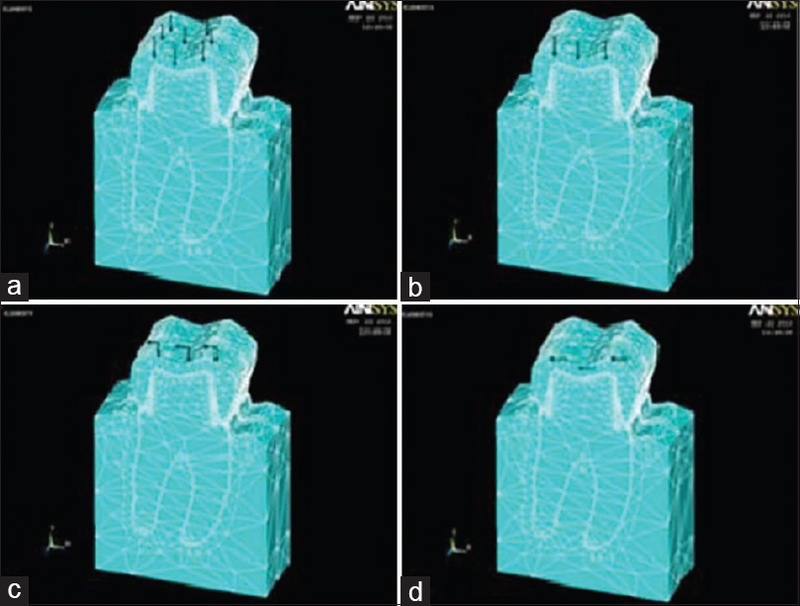 ICZ and Lava crowns also allowed the least amount of stress distribution to the surrounding tooth structure, which is indicative of a favorable response of the underlying tooth structure to the overlying full-coverage indirect restorative material. These results suggest that ICZ and Lava crowns can be recommended for clinical use in cases of badly damaged teeth. Aim: The purpose of this study was to evaluate the effect of different denture cleansers on the color stability, surface hardness, and roughness of different denture base resins. Materials and Methods: Three denture base resin materials (conventional heat cure resin, high impact resin, and polyamide denture base resin) were immersed for 180 days in commercially available two denture cleansers (sodium perborate and sodium hypochlorite). 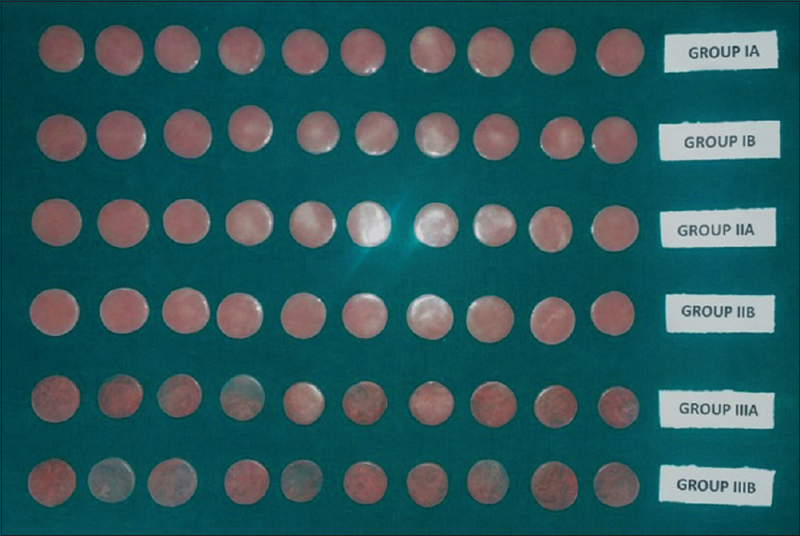 Color, surface roughness, and hardness were measured for each sample before and after immersion procedure. Statistical Analysis: One-way analysis of variance and Tukey's post hoc honestly significant difference test were used to evaluate color, surface roughness, and hardness data before and after immersion in denture cleanser (α =0.05). Results: All denture base resins tested exhibited a change in color, surface roughness, and hardness to some degree in both denture cleansers. Polyamides resin immersed in sodium perborate showed a maximum change in color after immersion for 180 days. Conventional heat cure resin immersed in sodium hypochlorite showed a maximum change in surface roughness and conventional heat cure immersed in sodium perborate showed a maximum change in hardness. Conclusion: Color changes of all denture base resins were within the clinically accepted range for color difference. Surface roughness change of conventional heat cure resin was not within the clinically accepted range of surface roughness. The choice of denture cleanser for different denture base resins should be based on the chemistry of resin and cleanser, denture cleanser concentration, and duration of immersion. Introduction: Cleft lip and palate (CLP) is the most frequent congenital facial abnormality and multidisciplinary treatment extending over many years is necessary to rehabilitate the affected individuals to normal function and esthetics. Objective: To evaluate the clinical treatment outcome for missing teeth with tooth supported fixed partial dentures in unilateral cleft lip and palate patients. 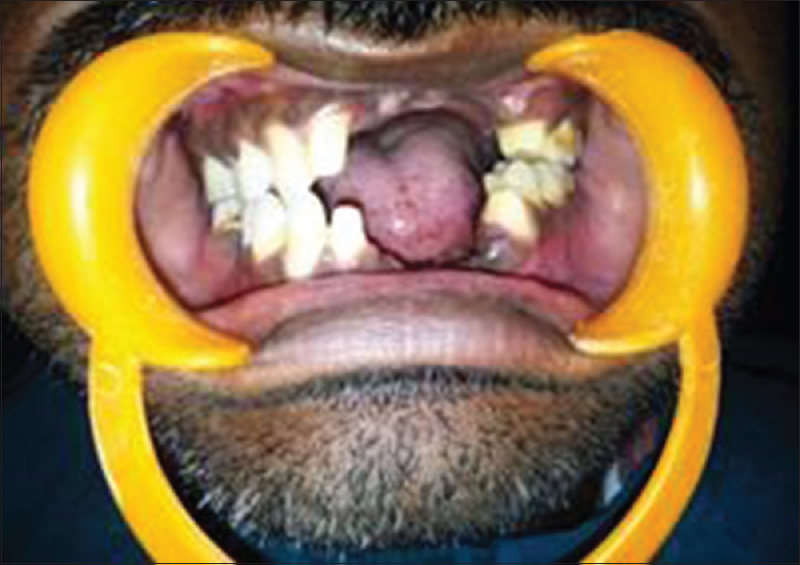 Patients and Methods: Tooth supported fixed partial denture (T-FPD) was utilized for restoration of missing teeth in the cleft area for 9 non syndromic, unilateral cleft lip and palate patients (U-CLP). The mean age of the patients was 25±4 years. The edentulous sites were prepared to receive ovate pontic for best possible esthetic results. Survival and complications were recorded following various biologic, technical and esthetic parameters up to 10 years of follow up. A clinical comparison was also made with respect to the periodontal status and development of new carious lesion between the restored cleft side teeth and corresponding teeth of the normal side with in the same patient. Results: Three failures experienced with fixed partial dentures were a result of ceramic chipping after 10 years, functional fracture after 3 years, and fracture due to external trauma after 2 years. Discussion: CLP patients undergo a lot of treatment; therefore understanding their opinions, expectations, and perspectives towards the prosthodontic intervention was given due importance. The provisional phase was utilized to educate the patients on the achievable treatment outcome and its limitation. In the present case series, out of three failed FPDs, only one restoration failed relatively early due to functional factors. Re-treatment was successfully achieved without change in the original material and extent of the FPDs. Conclusion: The outcome accomplished endorses the integral role of T-FPDs in the overall cleft care and it will remain a viable treatment alternative in select few patients in meeting their esthetic and functional desires. To assess the implant stability during different stages of healing in an immediate loaded implant soon after extraction. A 73-year-old female came with a chief complaint of bad smell and irritation in her lower front gum region. On examination, she was found to be completely edentulous in the maxillary arch and partially edentulous in the mandibular arch with only the canines present bilaterally. The posterior mandibular ridge was severely resorbed and hence could not be treated with a conventional mandibular complete denture. Considering the age of the patient and the preference of only a single surgical visit, we decided to plan for a conventional maxillary denture against an implant supported mandibular overdenture with two implants placed immediately after extraction of canines. The stability of these implants was assessed during the early phases of healing with the help of a resonance frequency analysis method (RFA) using Osstell ISQ™. During the healing phase, implant stability quotient (ISQ) values decrease by 4–5 values after installation with the lowest values at the 1st week postplacement. Following this, the ISQ values increased steadily for all implants up to 16 weeks. No significant differences were noted over time. At placement, the mean ISQ values at 33 and 43 regions were 74 and 75.2, respectively. The mean lowest ISQ values recorded at the 1st week were 58.8 and 65.4, respectively. At 16 weeks, the mean ISQ values were 70.5 and 67.9, respectively. The survival of such immediately placed implants, which are later used as overdenture supported implants, are highly predictable when the surgical and prosthetic part is done meticulously. However, there needs future studies oriented to understand better the healing pattern of immediately placed implants in extraction sockets, which would guide the clinician with the optimal loading time. Materials used for fixed partial denture (FPD) frameworks have had properties of excellent strength, durability, and biocompatibility. Some of the materials which have been used till date include alloys, ceramics, and high-performance polymers such as zirconia, Ni–Cr, lithium disilicate, and so on. All these, though excellent, have their advantages and disadvantages. Hence, the search has always been on for a better material. One such material, which has made its foray into dentistry in the recent times, is polyetheretherketone (PEEK). It is a semicrystalline thermoplastic material. PEEK has an excellent chemical resistance and mechanical properties that are retained at high temperatures. The versatility of PEEK as a dental material for FPD framework was evaluated in this case report. Introduction: Maxillary obturator prosthesis is more frequent treatment modality than surgical reconstruction for maxillectomy in patients suffering from oral cancer. The obturators often become heavy and hence are hollowed out in the defect portion to reduce its weight as a standard practice. Materials and Methods: The processing technique described the incorporation of the preshaped “wax-bolus” during packing procedure of the Obturtor prosthesis and eliminated later by melting it once the curing procedure is completed. Results: This article is a single step procedure resulting into the closed-hollow obturator as single unit with uniform wall thickness around the hollow space ensuring the least possible weight of the hollow obturator. Conclusion: This processing technique achieves predictable internal dimension of the hollow space providing uniform wall thickness of the obturator. A 42-year-old male patient complaint with missing right eye was referred to the Department of Prosthodontics and Crown and Bridge. 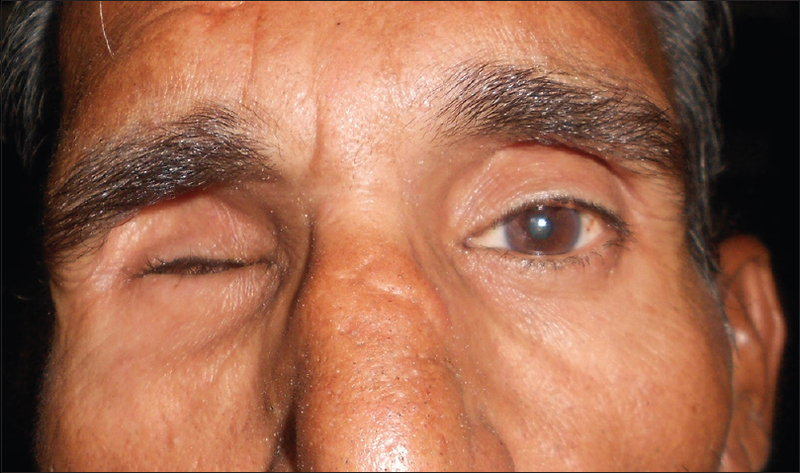 This patient was seeking artificial eye replacement. On careful clinical examination, a defect with a shrunken orbit and intact tissue bed was found in the patient. As the patient was economically very poor, modified stock ocular prosthesis was advised. To rehabilitate this ocular defect, “single” appointment technique with clinically available material was adopted, which is discussed in the present communication. Disclusion time reduction (DTR) is an objective treatment protocol using T-Scan III (digital analysis of occlusion) and electromyography for treating occlusally activated orofacial pains. 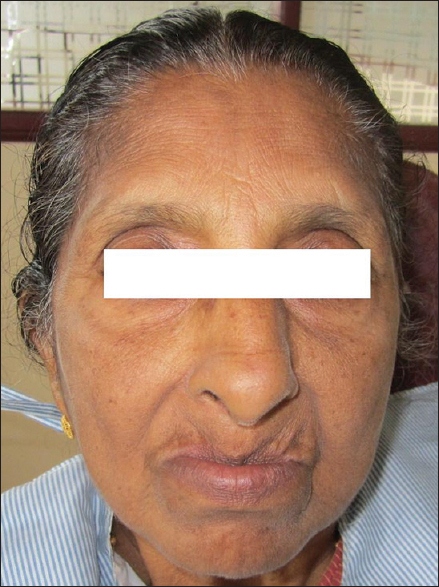 Chronic occluso-muscle disorder is a myogenous subset of temporomandibular disorder symptoms. These muscular symptoms are induced within hyperactive masticatory muscles due to prolonged disclusion time, occlusal interferences, and occlusal surface friction that occur during mandibular excursive movements. 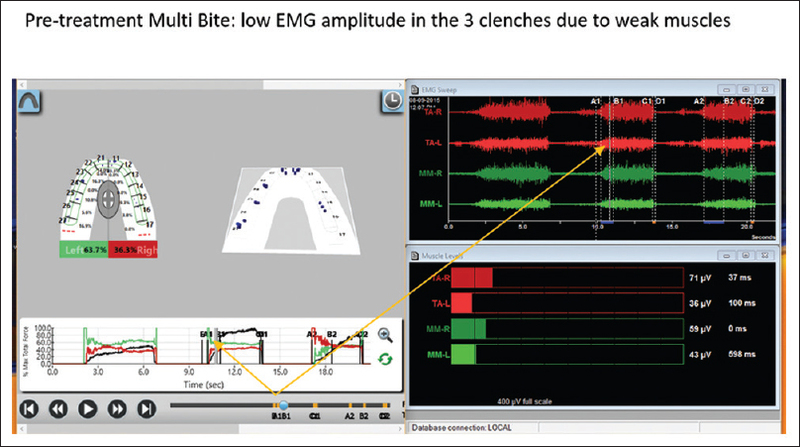 This case report describes a patient treated by DTR therapy, whereby measured pretreatment prolonged disclusion time was reduced to short disclusion time using the immediate complete anterior guidance development enameloplasty, guided by T-Scan occlusal contact time and force analysis synchronized with electromyographic recordings of four masticatory muscles.